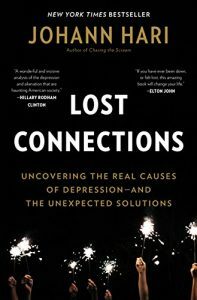 I heard Ezra Klein interview Johann Hari on his podcast, and was intrigued by the premise of his new book, Lost Connections. The book is an exploration of the ways in which our culture contributes to the depression and anxiety that many people experience. I don’t really know whether the book would be helpful to someone suffering from clinical depression or anxiety, but as a critique of a culture that can leave people feeling unhappy and unfulfilled even when they have achieved the cultural markers of success and an exploration of ways to challenge and perhaps remake that culture it makes really interesting reading. Hari has struggled with depression, and took antidepressants for many years without really finding relief. He went in search of answers about what causes depression and what might help him feel better. I am not convinced his survey of the science about chemical antidepressants is completely even-handed, although I agree that there is a lot we don’t know about how they work and when they will and will not work well. It is not my scientific background, and I haven’t done a survey of the literature, so it is probably just my sense of how hard it is to establish efficacy to the FDA that makes me skeptical of his skepticism. It won’t surprise anyone who knows my employment history that I do not share Hari’s negative opinion of the pharmaceutical industry. It is not a perfect industry, but I think most of the scientists working in it genuinely want to find medicines that improve people’s lives, and are pretty rigorous about following the methods that allow us to assess whether or not a pill does what it is intended to do. But the majority of the book is not about the failings of the pharmaceutical industry, and he emphasizes that if a chemical antidepressant works well for someone that is great, so I decided to just gloss over the bit of the book that talks about chemical antidepressants and what they can and cannot do for people, and focused instead on the cultural critique and Hari’s ideas for finding our way towards a healthier culture and a happier way of living. As I did with Laura Vanderkam’s Off the Clock, I’m going to share the ideas in the book that resonated the most with me. There are many more ideas in the book, so if you find these ideas interesting, definitely get a copy and read it. It is well-written and enjoyable. I also want to emphasize that I am approaching this book as a cultural critique, and nothing I write here should be taken to imply that I think people who are dealing with depression and anxiety are “to blame” for their own suffering (I 100% do not think that) or should follow any of the ideas in the book. I did find ideas that I, a generally happy person who sometimes feels like my daily life has devolved into a bit of an uninspiring slog, might apply in my life. But that is a different situation. The first idea that really struck me was in the opening pages of the book: Hari talks about getting terribly sick after eating an unwashed apple in Vietnam, and how the doctor in the hospital to which he was taken told him that the nausea he was experiencing was a message, and that by listening to that message they would figure out what was wrong. Over the course of his research, he came to view his depression as a message, and that perhaps by listening to it he could figure out what was wrong. This idea resonated with me. Whether or not depression like Hari experienced is a message, I think there is definitely a message in the vague feeling I sometimes get that there should be more to my life than trudging through my routine, not fully engaged in what I am doing. The message is telling me that something is out of whack, and I would be wise to listen and do some reflection to identify what in my life needs fixing. Given the level of material comfort at which I live, there is no reason for me to resign myself to feeling like life is a slog. I am fortunate enough to have resources I can use and choices I can make to change things. And yet, I think we all know that there are many materially comfortable people who find life unfulfilling and are deeply unhappy, even if they are not clinically depressed. Why is that? This was another area in which I found Hari’s ideas interesting. He spends some time on the human need for a sense of purpose and a feeling that what we do can help us achieve that purpose. He discusses this with respect to our work lives, and covers the research about how a lack of control at work correlates with being unhappy and stressed out. He goes further to think about how the way we organize our work places can be changed to give people back control, and highlights the idea of democratic cooperatives as a different way to work. This was an interesting chapter, but I’m going to gloss over it here, not because I didn’t find the ideas compelling, but because I think they’re interesting enough that I’d like to explore them more. I actually have quite a bit of autonomy at work and feel like the work I do has purpose, so I don’t think this set of ideas is the answer to why I sometimes get that “life is a slog” feeling. But I have long had an interest in how work could be organized so that more people have the sense of autonomy and purpose I have at work, so I’ve made note of Hari’s sources in this chapter and hope to come back to the topic again later. Hari organizes his book into a set of nine “disconnections” that can contribute to depression and anxiety. The disconnection from meaningful work is one of them. I found something of interest in all of the disconnections he identifies, but the one that I’ve found myself thinking about the most is the disconnection from meaningful values. In this section, Hari talks about how our cultural focus on money and material goods as status markers can leave us feeling empty and unfulfilled even as we have all the signs of success. Hari describes research that found that the more strongly materialistic a person’s values are, the less joy they experienced and the more despair they felt, and then he delves into why that might be. One reason is that being materialistic can interfere with your ability to form and maintain meaningful relationships, leaving you feeling alone (and that is another thing that correlates with unhappiness – the section on loneliness in this book is very moving). Another is that being strongly materialistic means you’re more focused on extrinsic motivators, but it is when we’re doing something for an intrinsic motivation that we’re more likely to achieve that magical “flow” state that can bring us a lot of joy. The third reason he identifies for why being materialistic makes you less happy really struck me: “Materialism leaves you constantly vulnerable to a world beyond your control.” It is not just that material things can be more easily lost, it is that by focusing on the material things, you’re deriving your sense of worth from comparing yourself to others and from what you believe others think of what you have. Someone will always have more money, and so you can never be satisfied. Finally, materialism can crowd out the things that would actually give you joy and a sense of meaning. The more you focus on obtaining material things, the less time you have to focus on your relationships and the things you might pursue just for the joy of it. We all think we would trade a little less salary for more time or more flexibility, but when given the choice many people choose the money, even when the difference is not large enough to make a big difference in the lifestyle they can afford. It is hard to walk away from more money, because so much in our culture is geared towards making us want to buy more things and to buy more things, we need more money. I’ve spent a lot of time thinking about this part of the book. The solutions Hari offers here are societal, and I, too, would like to see a less materialistic culture. But that is not going to happen in my lifetime, so how do I train myself to ignore the siren call of money and material goods and keep myself focused on the things that really matter to me? Where is the line between wanting the money to live comfortably (which I definitely have, and want to maintain) and allowing the pursuit of money to take over too much of my decision-making? I don’t know. It is something I think about a lot, particularly when I look at my retirement accounts and try to project forward to my future non-working years. In this and in other areas of disconnection, Lost Connections doesn’t have all the answers, but it definitely poses some good questions. I’ll be thinking about them for quite some time.